CULVER CITY, Calif. (Aug. 1, 2016) – In advance of the theatrical release of Inferno(Oct. 28), Sony Pictures Home Entertainment celebrates the 10thAnniversary of the global phenomenon by bringing the blockbuster films THE DA VINCI CODE and ANGELS & DEMONSto next-generation 4K Ultra HD and back to Blu-ray Oct. 11. Two-time Academy Award® winner Tom Hanks (Best Actor: Forrest Gump, 1994 Philadelphia, 1993), Academy Award winner Ron Howard (Best Director & Best Picture, A Beautiful Mind, 2001), and bestselling author Dan Brown teamed up for both thrillers that followed the exploits of symbologist Robert Langdon (Hanks). 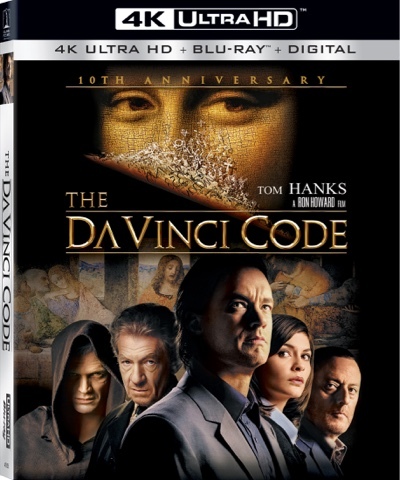 THE DA VINCI CODE and ANGELS & DEMONS on 4K Ultra HD feature four times the resolution of high definition, high dynamic range (HDR)--which produces brilliant highlights, vibrant colors and greater contrast on compatible displays--and Dolby Atmos audio, remixed specifically for the home theater environment, delivering captivating sound that places and moves audio anywhere in the room, including overhead. The murder of a curator at the Louvre reveals a sinister plot to uncover a secret that has been protected since the days of Christ. Only the victim's granddaughter and Robert Langdon (Tom Hanks), a famed symbologist, can untangle the clues he left behind. The two become both suspects and detectives searching for not only the murderer but also the stunning secret of the ages he was charged to protect.